People typically shy away from sprouted garlic, veggies, and seeds. Some think it doesn't look good or they don't see the benefits of going that extra step. Many tend to associate growths with spoilage or think it's all-around weird in appearance or texture. Although it's true that the medicinal plants mentioned below are wonderful, they can get even better with a little patience and an open mind. Whether sprouting them yourself or purchasing sprouts from the store, find out why this method has become so popular. Sprouted whole grain flour contains 10 to 20 times the nutrients of processed whole grain flour. Garlic is delicious and great for you. It can lower cholesterol, prevent heart disease, boost your immune system, and it is flowing with antioxidants. That antioxidant power can become even stronger when garlic is sprouted as studies have found that when you let it sprout, its medicinal benefits are significantly enhanced. For example, sprouting improves its ability to prevent signs of aging due to oxidative damage, as well as fight colds and bacterial infections. Most people are irked when they see an overgrowth of green sprouts on top of their onions when they've been sitting around for a while, but as long as they aren't soft or browned, they're perfectly edible. You can chop up the green part and add it to a fresh salad and use the onion to make another savory dish. Interestingly, sprouted onions retain all of their cardiovascular and bone-strengthening benefits. You have probably found alfalfa sprouts on your sandwich at some point. In fact, some people pick them out, because of the tadpole-like appearance or ask for their meal without it. What you are giving away, however, is precious nutrients. Flax seeds, when soaked in water, sprout in about six days. The result is a crisp, refreshing, and pretty much flavorless green that is full of vitamins A, B, C, E, K, iron, magnesium, and more! Remember this next time you're putting them off to the side. This little Central American herb was the "superfood" of the Aztecs, giving them energy and strength. Chia seeds have seemingly endless uses and benefits, such as fighting diabetes, packing up on omega-3's, and strengthening your bones and teeth. The seeds are also so easy to sprout that they became a popular kid's activity - the chia pet! The lush micro-greens are found to have much higher nutrient density than the mature plant, including amino acids, iron, and B vitamins. Flax is a powerful herb, containing high amounts of fiber, omega-3 fatty acids, and lots of other essential minerals, such as magnesium and manganese. Whole flaxseeds are difficult to digest, because of certain compounds on the outer shell, such as phytic acid and tannins, which might prevent the seeds from releasing their nutrients. Sprouting them helps remove these compounds and make flax's nutrients more easily absorbable. To start, sprinkle them evenly on a wet paper towel and keep it moist for up to ten days, until they start to sprout. People are usually surprised by how easy it is to sprout their own herbs. This is likely because it is a natural process that happens to plants on their own over time or when exposed to water, as they often are. Many raw foodists believe this is how the plants are supposed to be consumed and feel that the life-force energy from the sun is best ingested through the plant in this form. 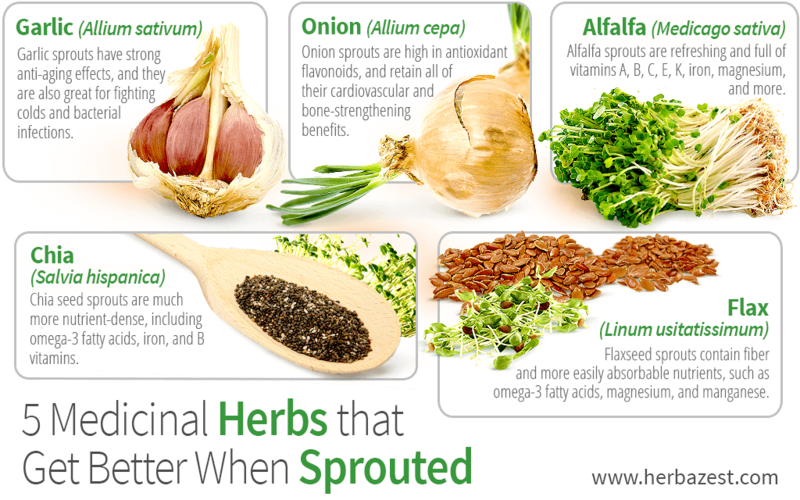 However philosophical you care to get, consuming these sprouted herbs is simply healthy, and you will feel great.